Choose “Internet Site” when the configuration ask for it. The next parameter ‘virtual_mailbox_base’ is a prefix for all virtual mailbox pathnames (see below). So, ‘/home/vmail’ is the base directory where our mail will be stored. You can use whatever you wish (but remember your choice when you create the ‘owner’ user of your mail, see below). In the ‘virtual_mailbox_maps’ parameter we specify the file which will act as lookup table for our email addresses mailbox (maildir in our case) pathnames. That file is a simple two-column text file. In the first column you specify an email address and in the second you define the location of the corresponding mailbox (relative to ‘virtual_mailbox_base’). Note the slash / in the end of each path. That slash designates a Maildir format – if you omit the slash, it will use the mbox format. Prefer the Maildir format over mbox, as it keeps emails in separate files, allows for multiple applications to read mail, etc. As you see in the third line, you can declare aliases here as well, i.e. to have webmaster delivered to info’s mailbox. 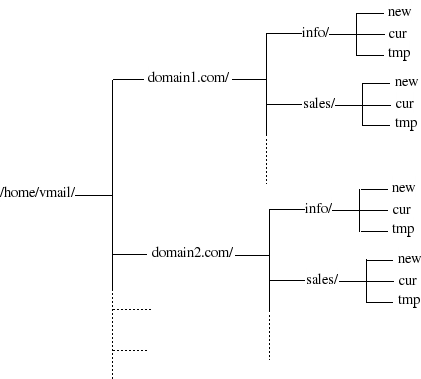 You don’t need to create the directory structure yourself; it is automagically created when each user gets the first email. ‘virtual_minimum_uid’ specifies a lower bound on the mailbox or maildir owner’s UID as a safety mechanism. ‘virtual_uid_maps’ and ‘virtual_gid_maps’ specify that all mailboxes will be owned by a used with uid and gid 5000. We will create that user below. ‘virtual_alias_maps’ allows us to mix virtual aliases with virtual mailboxes. For instance, we can have domain1’s postmaster mails delivered to [email protected] or local postmaster or root or even an external email address. The former command creates a named group while the latter creates the user with the desired uid/gid 5000 and its home dir in /home/vmail. Enter a Subject, press enter, write something, press enter, write a full stop (.) and you’re done. The mail should be delivered to /home/vmail/domain1/info/new – you should see a plain text file there. Mail did not deliver? Check your DNS settings! Use tail -f /var/log/mail.log to see the Postfix log for any errors.